Mother Teresa Becomes A Saint As Pope Francis Holds Canonization In Vatican City : The Two-Way She's long been considered a model of selflessness by many, for a lifetime of service to the world's most impoverished. Sunday's canonization marks a highlight for the pope's Jubilee Year of Mercy. 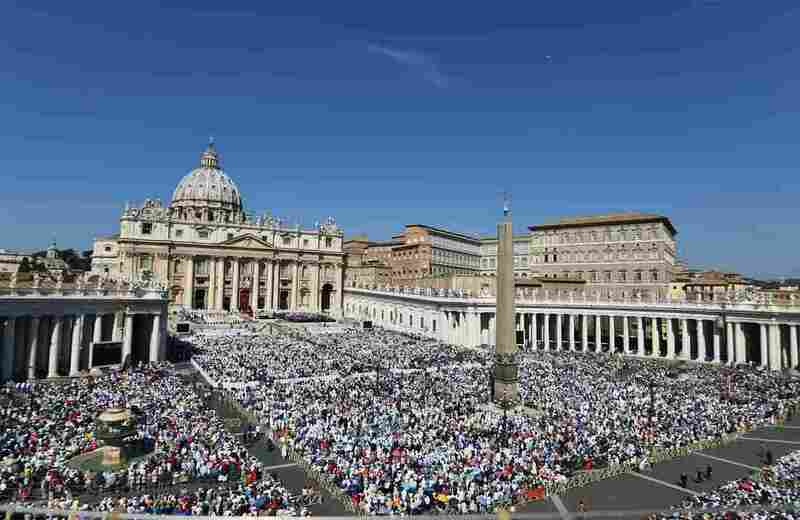 Tens of thousands attend the Holy Mass and canonization of Mother Teresa of Kolkata, in St. Peter's Square at the Vatican on Sunday. Pope Francis officially declared Mother Teresa a saint before a crowded St. Peter's Square on Sunday morning, 19 years after her death. Applause broke out from the tens of thousands in attendance even before Pope Francis finished the canonization at the start of Mass. Globally revered by both Christians and non-Christians for her lifetime of service to the world's most destitute and sick, Mother Teresa most notably worked in the slums of Calcutta, India, and a number of other countries. Pope Francis described her as an "eloquent witness to God's closeness to the poorest of the poor." His formal declaration marks a highlight for the pope's Jubilee Year of Mercy, in which he recognizes the nun as an icon of mercy. But the declaration of sainthood does not come without questions surrounding Mother Teresa's legacy, by critics who believe her fame exceeded her service. ... she's also been severely criticized, most prominently by the late British writer Christopher Hitchens, who argued that Mother Teresa's true agenda was to convert the people she helped to Christianity and that her belief in the virtue of a suffering led her to withhold anything but the most rudimentary medical care. Writer and Calcuttan Ruchir Joshi says it's not conversions that bother him but Mother Teresa's failure to use her indisputable clout to go beyond what he calls a self-serving cycle. Setting controversy aside, what does this formal rite of canonization mean for her title — do we now call her "Saint Teresa?" That would be correct — but Francis clarified at the ceremony that for many, the name "Mother Teresa" will live on.